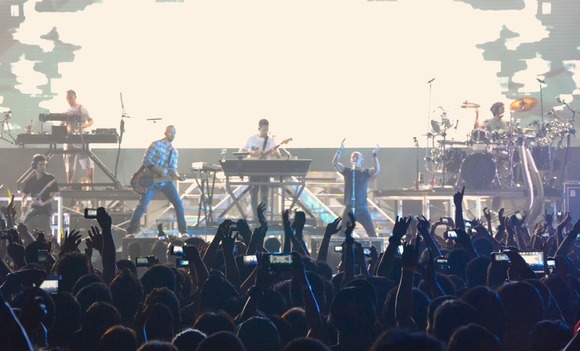 PASAY, Philippines — Touring in support of its new albumLiving Things, Linkin Park brought its high-powered alt-metal-rap-rock to the Philippines’ for only the second time in its career, performing at the SM Mall of Asia Arena on August 13. Audio for the 20,000-seat arena was supplied by Manila-based tour sound contractor SoundCheck (www.soundcheck.com.ph), with a massive sound system featuring 128 HARMAN JBL VTX Series line array loudspeakers and subwoofers powered by 30 Crown VRACK amplifier systems. Thirty Crown VRACK amplifier racks and three custom Crown racks powered the loudspeakers. VRACK is a complete, transportable amplifier solution that includes Crown I-Tech HD Series power amps, analog and digital connections and a universal power distribution system, housed in a wheeled rack with a suspension system that enables VRACKs to be suspended. Total amplification for the Linkin Park system added up to 78 Crown I-Tech 12000HD amplifiers, nine I-Tech 9000HD and 12 I-Tech 4x3500HD amps. SoundCheck used JBL HiQnet Performance Manager™ software to set up and control the system.